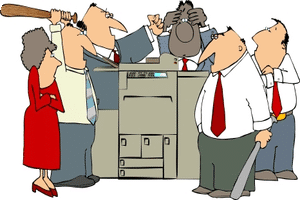 Is your copier keeping up with the growing demands of your business? Many people experience growth in their business in the years following the time they signed their first copier lease. This can mean that your old machine may not be able to keep up with the demands that you now face. It’s times like these that you should ask yourself if you are ready for an upgrade. Upgrading your copier can take your business to the next level. A reliable and powerful printer or copier is essential in most offices. Settling for an inferior product will only stop your business from continuing the growth it’s had in the past. If you are considering a copier upgrade then there is no better place to go than Albuquerque Copier. Our staff is the best around at helping you get exactly what you need. We can look at your last lease and the new demands that your business is facing to help you make a good choice. The best time to consider getting a new copier is near the end of your lease. This way you can begin searching early for better options and you won’t have to terminate a current contract, which can be expensive and annoying. This also gives you the chance to walk away from a leasing company that you may not have liked in the past. Give us a call today at Albuquerque Copier if you think you are ready for an upgrade. We can help you make a smart choice when it comes to planning for your business’s future.